Gold was steady overnight, trading in a narrow range of $1283.15 - $1286.50 against a similarly steady US dollar (DX from 96.21 – 96.38). Weakness in the yen (109.31 – 109.79) from the BOJ cutting its inflation forecast from 1.4% to 0.9% and weak export data was largely offset by strength in the pound ($1.2944 - $1.3042, 2-month high) as rumors that the UK’s Labor Party could support a proposal to delay Brexit until the end of the year – further dimmed the chances of no-deal Brexit on March 29. Global equities were mixed with the NIKKEI off 0.1%, the SCI was up 0.1%, European markets ranged from -0.3% to +0.2%, and S&P futures were +0.3%. 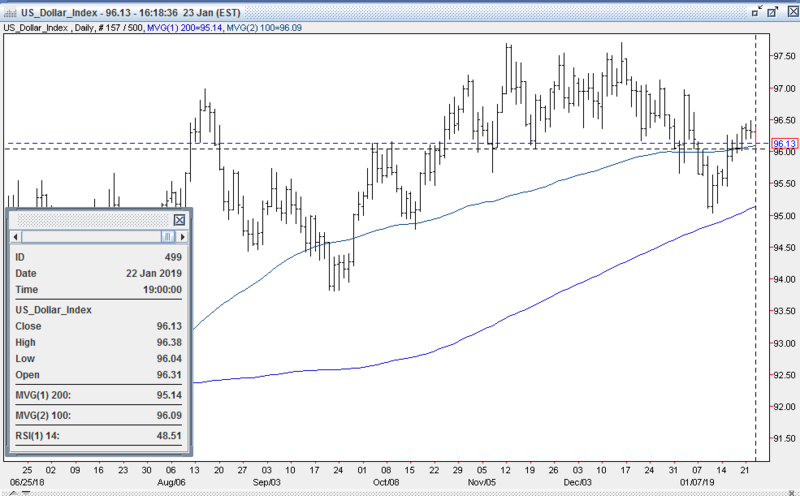 A rebound in oil (WTI from $52.69 - $53.62) was supportive of stocks. Just ahead of and through the NY open, stronger earnings from P&G, United Technologies, and Comcast along with some upbeat comments on the economy from JP Morgan’s Jamie Dimon lifted S&P futures further (+15 to 2647), and took the US 10-year bond yield up to 2.775%. 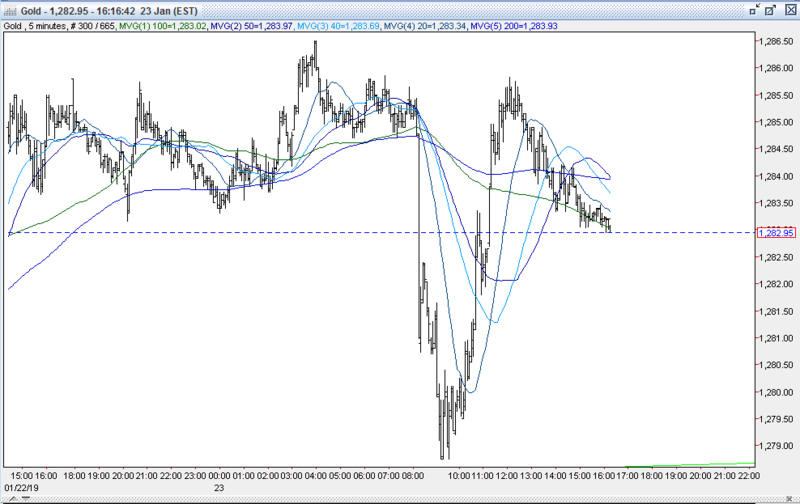 The DX rebounded to 96.36, and pressured gold lower. Support at the overnight low gave way, and gold slid to $1280.70. US stocks opened stronger (S&P +21 to 2653) helped by a better than expected reading on the US House Price Index (0.4% vs. exp. 0.3%), and comments from Chinese VP Wang Qishan saying that China and the US were mutually indispensable. Gains in the Consumer Staples and IT sectors led advancing shares. The 10-year yield hovered around 2.77%, and the DX rose further to 96.38. Gold continued to slide, and pulled back to $1278.75. However, support emerged ahead of the quadruple bottom at $1277 (12/28, 1/4, 1/21, and 1/22 lows), and bargain hunting buying lifted it quickly back to $1280. The equity rally soon fizzled, and US equities turned negative by late morning (S&P – 10 to 2622), with the Energy and Materials sectors leading the decline. 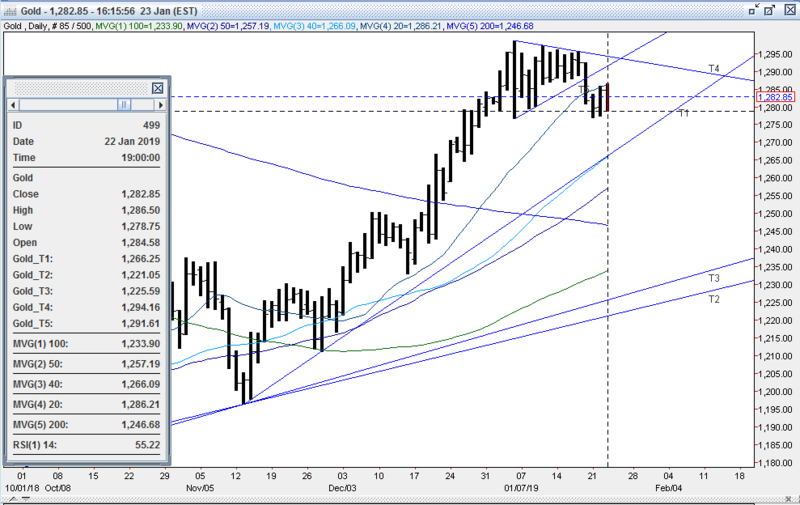 A plunge in oil (WTI to $51.84) contributed to the move. The 10-year yield retreated to 2.739%, and the DX fell to 96.04. The DX was under additional pressure from a continued rise in the pound ($1.3080), and a bounce in the euro ($1.1351 - $1.1394) with increasing talk that it is highly likely that the Labor Party will back the plan to delay Brexit. Gold rose in response, and climbed to $1285.50. In the afternoon, US stocks pared losses, with the S&P finishing with a small gain (S&P +6 to 2639). The US 10-year yield clawed back up to 2.757%, while the DX ticked up to 96.14. Gold edged lower to $1283, and was $1283 bid at 4PM with a loss of $1. Open interest was up 5.1k contracts, reflecting some new longs from yesterday’s gain. Volume was much higher with 407k contracts trading - inflated by the Feb-April contract rollover. 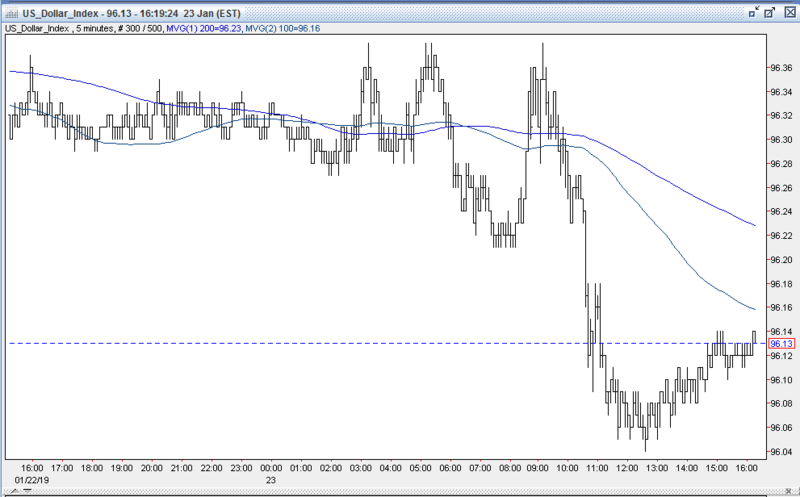 Some bulls were disappointed that gold couldn’t advance today, given the decline in the DX to 96.04. However, other bulls were pleased that after its pullback to $1277, the yellow metal has put in 3 consecutive higher lows and higher highs, and seems to be putting in a base from which to trade higher. While we haven’t seen the COT report in 4 weeks, bulls maintain that despite gold’s sharp rally, a significant amount of large fund shorts are still remain, and will provide further upside momentum when forced to cover. Bulls expect a retest of initial resistance at the old support level of $1286-88, followed by a retest of the stubborn level $1295-98 (8 tops –1/3, 1/4, 1/10, 1/11, 1/14, 1/15, 1/16, and 1/17 highs). Above here, bulls expect to trip some significant short covering that they feel should open up a test of next resistance levels at $1303 (6/15/18 high), $1309 (6/14/18 high), and $1315 (5/15 high). Bears felt gold’s rally to $1298 was overdone, and were pleased with the pullback to $1277. They also feel the 20% correction in equities – much of which occurred during very illiquid holiday trading – was also overdone, and expect the rebound seen over the past month to continue. Bears feel that the plunge in the US dollar seen since 12/14 (97.71 – 95.03, 2.74%) has also overshot, and look for the rebound in the greenback to carry forward. Bears will look for a breach of initial support at $1277-79 (5 bottoms – 12/28, 1/4, 1/21, 1/22, and 1/23 lows) to trip more stale bull selling to lead to a test of $1265-67 (12/25, 12/26 ,and 12/27 lows, and up trendline from 11/13 $1196 low). They expect gold’s correction to extend to at least $1247 – the 50% retracement of its up move from the 11/13 $1196 low, and the 200-day moving average.